When you’re not sure what to buy someone as a gift and with so many products to choose from, why not let them choose for themselves. It's especially handy for holiday gift-giving, wedding and house warming gifts. An IKEA Gift Card has no limitations on how many times it can be used. You use this IKEA Gift Cards exactly like cash to make any purchases at IKEA Check-outs, Restaurant & Bistro and Swedish Food Market. You can make multiple purchases with this re-loadable card. The value of the IKEA Gift Cards cannot be exchanged for cash. Loss or stolen cards will not be replaced. The IKEA Gift Cards will expire if not used for two years. During the redemption of goods, if the value of the goods exceeds the amount stated in the gift card, the difference thereof will be paid by the bearer. 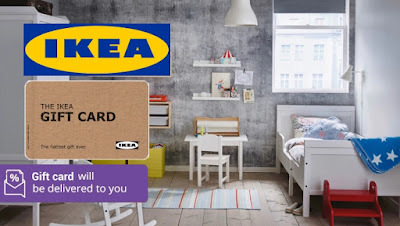 IKEA Malaysia shall not be held responsible for the loss or damage of this gift card and any of the losses or damages suffered by the bearer of this gift card that arise from or in connection with the loss or damage of the gift cards. Gift card will be delivered 7 working days from the date of redemption. Damaged Gift card will be considered as invalid gift cards and will not be replaced. Gift cards cannot be exchanged for cash, or any other forms of legal tender. Gift card Malaysia reserves the right to vary and amend any of the above terms and conditions without prior notice. Gift cards purchased on 8excite are non-refundable unless stated otherwise.